From “McPick 2 for $2” to “McPick 2 for $5,” McDonald’s quest to replace the Dollar Menu has already taken on two different variations. 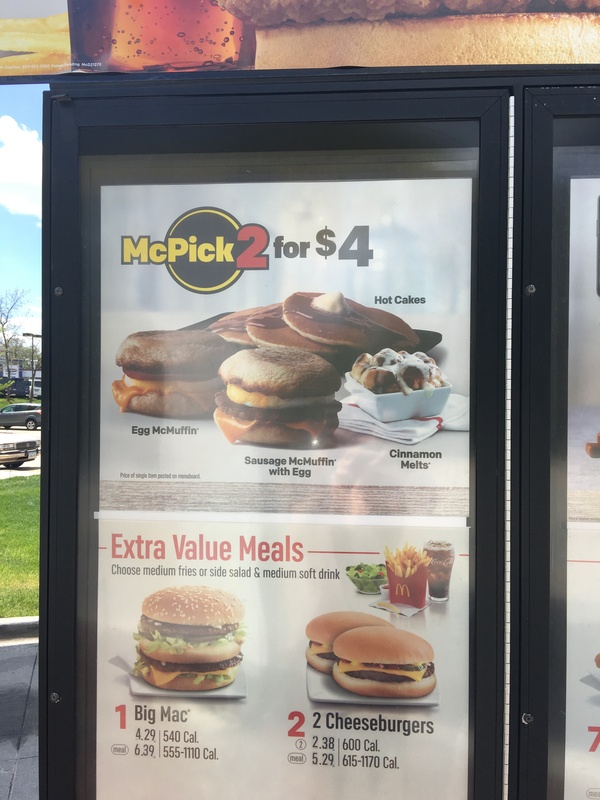 Now, it looks like the fast food giant is taking a page from someone else’s playbook by creating the “McPick 2 for $4,” this time focusing on breakfast items. McDonald’s began airing commercials and posting signage for the latest meal deal recently, mashing up the popularity of its new all-day breakfast menu with customers’ desire for a good deal. We first spotted the change on Tuesday after hearing an early morning commercial that promoted the deal including Egg McMuffin, Sausage McMuffin with Egg, Hot Cakes, and Cinnamon Melts. A trip to a local Des Moines McDonald’s found the deal advertised only at the drive-thru. We reached out to McDonald’s for comment on the change and will update this post when we hear back. For now, it appears that only some McDonald’s restaurants are offering the deal. Posts on Twitter show several locations were still serving the 2 for $5 meal option as recently as Monday. The change to the more costly deal may have alienated some customers looking for a quick, inexpensive fast food fix, some who noted they’d go to competitors for a less expensive, more robust meal. The company’s latest option may be an attempt to reclaim some of those customers. However, the ability to only order breakfast might not go over well with those who prefer to leave morning meals in the, well, morning. Or those who simply aren’t interested in trying to keep track of all the company’s changes. Of course, we shouldn’t be surprised by all the menu changing at the Golden Arches; the company continually revamps its menu in hopes of attracting and keeping customers. Back in 2012, the company tried the “Extra Value Menu” that offered items for a range of prices. When that didn’t catch on, it tried the “Dollar Menu & More” option in 2013. Still, the back and forth with meal deal menus can be confusing for customers who could get a similar — and consistent — deal at other fast food restaurants. Additionally, the new 2 for $4 promo puts McDonald’s in line with other fast food meal deals: Pizza Hut will sell you items from a set menu for $5 each as long as you buy at least two; Wendy’s is offering a $4 meal where you get a Junior Bacon Cheeseburger, chicken nuggets, fries, and a drink; Burger King’s 5 for $4 menu includes bacon cheeseburger, small fries, chicken nuggets, beverage, and a chocolate chip cookie; and Hardee’s and Carl’s Jr. have a $4 meal with a double cheeseburger, chicken sandwich, fries, and drink. However, it is similar to Taco Bell’s new “Morning Value Menu.” Included on the menu are 10 breakfast items, some of which are new, for $1 each.